It’s always rewarding when you get to harvest something you have grown and prepare it immediately for eating. It’s literally from garden to table (or mouth) in less than an hour in most cases. That – apart from the aesthetic of overflowing, luscious, green foliage, is the most rewarding part about ‘growing your own’. The least rewarding part is to find that some nasty bug/s have eaten through your most tender plants and left holey, limp, sad looking scraps in their wake. In our garden, there are three main pests that compete with us for the veggies that we grow – snails, earwigs & cabbage moth. I have worked out the best way – that works for me – to get rid of all or at least lower their numbers such that the damage they do is no longer significant. I built this canopy over one of our veggie patches for the sole purpose of protecting my recovering brassica patch from the dreaded cabbage moth. It reminds me of a canopy bed – and aside from that DIY look, it really is just that – the ‘bed’ part however just happens to be a ‘garden bed’. 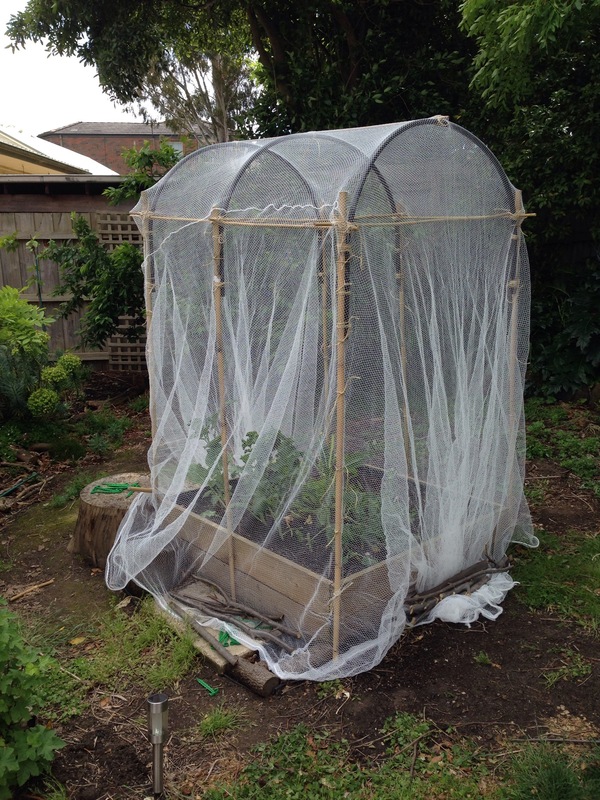 I have built these before in the garden but this time I bought a netting with smaller holes so that the cabbage moth would have absolutely no way of squeezing into the space. This is Stage 1 of the canopy. I still need to tighten the netting around the base and trim off any excess.